With just 1-2 years of study at nursing school, you can get your certification or associate's degree as an LPN (licensed practical nurse) or RN (registered nurse). Tailor your nursing degree to your needs -- nursing courses are available anywhere from community colleges and trade schools to masters programs. 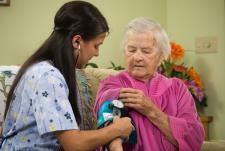 The Associate Degree in Nursing (ADN) takes two to three years in a community college or trade school. This degree will prepare you to be a registered nurse in a specific area. It is up to you to pick what type of nursing you want to pursue. In four years you can earn a Bachelor of Science in Nursing (BSN) through state universities and private colleges. Unlike the ADN, the BSN will prepare you for a wide range of nursing settings. You will also be trained to handle administrative and leadership roles, which can aide you in promotions and long-term career goals. Later in your career you can take Master's level classes to increase your training. These degrees focus you into specialized technical and research roles. Whichever degree track you choose, you will learn the theory behind nursing, participate in hands-on opportunities to treat patients, and gain specialized information depending on the area in which you want to work. During your nursing training, you will get a chance to work in a hospital or other medical facilities to give you an idea of what to expect as a nurse. Numerous job opportunities exist for qualified nurses in the state of Georgia, especially in the fields of Women's Health, Occupational Health, Psychiatry, Midwifery, forensic studies and substance abuse treatment. Many clinical nurses in Georgia find employment in the state's more than 150 general hospitals. Others populate doctors' offices, schools, rehab centers, long term care facilities and private homes. Some nurses work in non clinical settings. These include teachers, counselors, researchers and administrators. However, no matter where you end up working as a nurse in Georgia, you'll need a nursing degree of some kind, and these days there are many kinds to choose from.